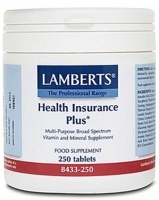 Lamberts Health Insurance Plus, a great all round multivitamin and mineral health supplement, rich in antioxidants and a full 200mg of magnesium per two tablets. Lamberts® Health Insurance Plus® is a two-a-day formula providing all of the most important micronutrients at moderate levels. Rich in antioxidant nutrients this formula also boasts a full 200mg of magnesium per two tablets. A further advantage of this two-a-day multi is its smaller tablet size in comparison to one-a-day products. 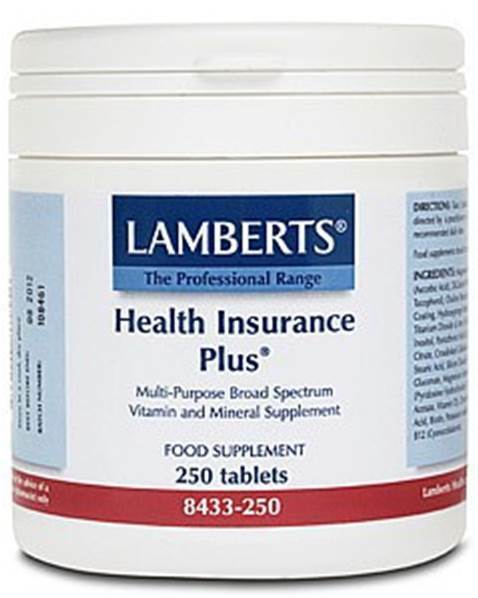 Lamberts® Health Insurance Plus® is a two-a-day formula providing all of the most important micronutrients at moderate levels, although the most important B vitamins are presented at high potency. It is the only multi in the Lamberts range that is iron free but otherwise the formula provides a good mix of the essential trace minerals. It also provides 200mg of magnesium per day, a mineral that is deficient in many people’s diets and which is generally not provided at a significant level in many multi vitamin and mineral formulas. The formula also provides three times the RDA of vitamin C, a level that greatly exceeds most other multis. If magnesium is an important consideration then we have two other products Multi-Guard Control or Multi-Guard Osteo Advance 50+, both of which also have high levels of magnesium. Cellulose DiCalcium Phosphate Tablet Coating (Hydroxypropyl Methylcellulose Cellulose Colours: Titanium Dioxide & Iron Oxide) Crosslinked Cellulose Gum Stearic Acid Silicon Dioxide Magnesium Stearate.